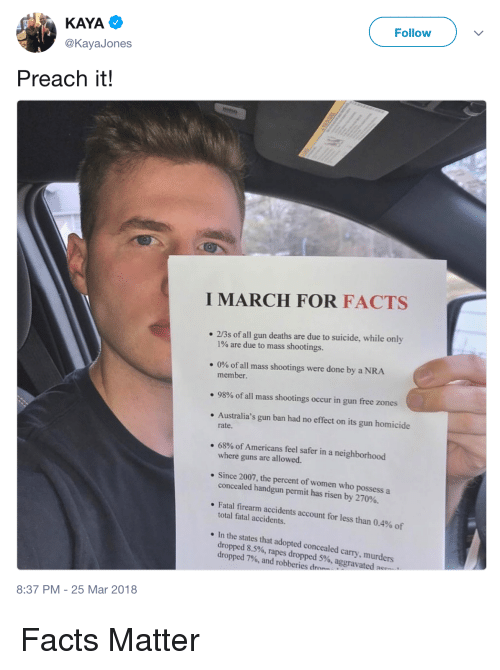 This photo popped up on my Facebook feed with the caption, “Just for the idiots out there.” Who these “idiots” are is unclear, but I infer that the writer is aiming his list at those who suggest that there might be effective actions to reduce gun violence other than more guns in more places. The list is something of a Gish gallop – a lot of isolated statements, many of them false, blasted at you in a hurry, with each one requiring some effort in response – aimed at making any effective reply too lengthy and arduous to undertake. Although the statistics are not entirely wrong, the context in which they are used is nebulous. It is one thing to tabulate numbers; it is quite another to conclude anything from them. I’m not sure I understand the intent of this list, or even if the author of the list can articulate one. This, of course, exacerbates the difficulty of a reply, since one may not be certain of what one is replying to. However, I shall do my best. Let us take a look at the statements individually. We can quibble with the accuracy of “2/3 of gun deaths are caused by suicide,” since the actual fraction is closer to three-fifths, meaning the initial statement is off by about ten percent. The Centers for Disease Control and Prevention puts the figure at just over 59 percent for the most recent year for which statistics are available. But more significantly, from this we conclude…..what? That since more people are killed by guns wielded by themselves than by others that we should not bother with addressing gun homicides, or gun violence in general? This untethered statistic does not say what its purpose here is, and I cannot determine it. Guns do figure greatly in the suicide death rate. A study reported in the American Journal of Public Health (AJPH) found that, as might be expected, a gun is very effective means of suicide – six percent of suicide attempts are by gun but they result in 54 percent of the fatalities, because suicide attempts by firearms are successful 85 to 95 percent of the time. This is important, because nine out of ten people who survive a suicide attempt do not attempt suicide again. It is also true, and it should be no surprise, that AJPH found suicides by firearms are proportionally more common in States where there is a higher percentage of gun ownership. However, the CDC reports that, nationwide, the rate of suicide deaths by firearms is declining, as is the rate of accidental death by firearms, while the rate of death by firearms homicide is increasing. Next there is the statement that no mass shooters have been members of the NRA. This might or might not be true, but if it is meant to suggest absolution of the NRA of any responsibility in mass shootings or other gun violence, it is wrong-headed. The NRA is and has been at the forefront of making more guns available to more people with fewer restrictions for over 40 years, which puts them right in the middle of the issue. The third statement is not only questionable on its face (where did the figure come from? ), but also so ambiguous as to have no meaning. What constitutes a “gun-free zone”? Seven out of ten mass shootings (again, the definition is subject to dispute, but the most common is “a single incident in which four or more people are killed or injured by gunfire”) occur in private homes, mostly ones in which firearms are owned by the residents or their guests. Those who would place 98 percent of mass shootings in “gun-free zones” apparently are talking only about shootings in places accessible to the public and use the definition of “a public place where private citizens are not allowed to carry guns.” This would include, for example, police stations, which are scarcely “gun-free.” There have been mass shootings at military installations, including Fort Hood and Washington Navy Yard, where there are armed soldiers and sailors. But since civilians may not carry guns there, they apparently qualify as “gun-free zones.” If all locations of mass shootings are considered, then by any reasonable definition, most mass shootings do not occur in “gun-free”zones, but in places where civilians are allowed to carry firearms. The statement about Australia is simply false. It apparently refers to the 1996 law (passed after a mass shooting that killed 35 people) in which Australia outlawed some semi-automatic long guns and instituted a mandatory buy-back of those already in private hands. Since then, there has been a significant decline in gun homicides. The government of Australia reports that both the nation’s current gun homicide rate and the homicide rate in general are the lowest in 25 years. The next two statements, about people reporting that they feel safer in neighborhoods where guns are allowed and about more women getting concealed-carry licenses, are presented without context and without citations. Thus they carry no meaningful implications. They’re just out there, unsupported and uninterpreted. Indeed, they may be simply made-up figures with no purpose other than to fill out the posting. The figure attributing 0.4 percent of accidental deaths to firearms is pretty close. The percentage is less than one, although closer to twice the posted figure. The last statement is demonstrably untrue. A study from Stanford University and another from Boston University are two of several that have found just the opposite of what the poster claims. States implementing concealed-carry laws have experienced an increase in their homicide rate overall and an even higher increase in the rate of firearms homicides. Next Next post: WHAT IS COLLEGE FOR?